Such disappointment. The heirloom Black Russians are not quite right. Every one of them: soft, dimpled and curvaceous with a crack right up middle. Only I could try for tomatoes and end up with ... bottoms. to much water the last 1 -3 days before this happens??? If I over water after my tomatoes have decided on their size - it causes them to crack (grrr). If I get them early enough they are still safe to eat.. I was going to say teh same thing as Sarah. 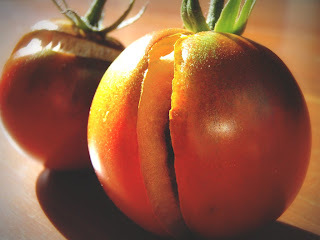 You need to water tomatoes consistently - when they have a big splurge of water after a certain point the flesh grows faster than the skin and they split. Oh at least yours have grown - ours are dismal this year.....not sure why but a real disappointment. All my black tomatoes cracked last summer, too. Such a disappointment..
Do they still taste OK? I hope so...! Ours are delicious when we get to them before the birds, or the 13 month old (who seems to think that just-about-to-start-ripening-tomatoes are de-lic-ious. Grrr.). Make chutney with them and no-one will know about their bootylicious beginnings. I wonder what you'd end up with if you tried to grow bottoms! I was going to offer you some green thumb advice but all that's coming out is "crack, hehehehehe"
I have been pulling mine off the vine at the first tinge of colour and leaving them on the window sill. So far so good with this method (touch wood).